I’ll be real with you and tell you I don’t really “get” the Arteon. I mean, I’m at last somewhat happy that something new is on the market that isn’t another crossover. Despite what the car companies will tell you, we definitely have enough of those. The Arteon ostensibly replaces the Volkswagen CC, and if you forgot that even existed, I forgive you. It never really set anyone’s hair on fire. 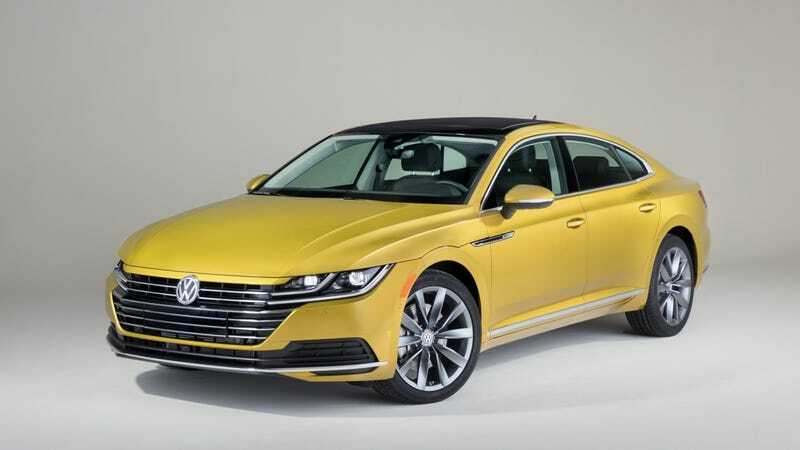 In theory, like the CC, the Arteon will be nicer and flashier than the Passat, which also hasn’t really set anyone’s hair on fire in some time since it existed in W8 wagon form. Did that much demand truly exist for a CC replacement? Anyway, the Arteon looks nice! It looks just fine. The grille’s a bit much, but it does that four-door coupe thing all the sedans are doing now. And I don’t mind that at all. I’m just saying that, presumably, the Arteon will be more expensive than a Passat; the CC was. The 2017 CC started at $34,475. Pricing for the 2019 Arteon hasn’t been announced yet, but I think it’s safe to guess it will be about as much as the CC. Probably more. You get a 268 horsepower 2.0-liter TSI turbo four and front- or all-wheel drive. It has an eight-speed automatic too. No manual here. Those things are... fine, but also nothing to scream about from atop a large building in your hometown. But is this really something you’d pay at least $34,475 for, if not more? Is that really how you should spend your hard-earned money? Over a Honda Accord, or even a Buick Regal TourX, or a Kia Stinger, or really anything else? You could even invest that money, or give it to a worthy local charity. Anyway, that’s what I think. One of our guys in Europe is driving it soon to tell you if it’s good or not. Maybe that will help. In the meantime, you gonna buy one?